Microsoft’s HoloLens augmented reality headset won’t ship to developers until early next year, but the company is already looking to PC makers for future versions. The first collaboration could come from Asus, which has been talking to Microsoft about building its own HoloLens headset, CNET reports. Microsoft’s Windows and devices head Terry Myerson said the decision is ultimately up to Asus, with CEO Jonney Shih saying the company was “still evaluating” the possibility. This appears to be Microsoft’s first direct acknowledgement that outside hardware makers can build on the company’s augmented reality platform, which is technically called Windows Holographic. The news isn’t a huge surprise, though, given Microsoft’s approach of licensing Windows to PC makers. 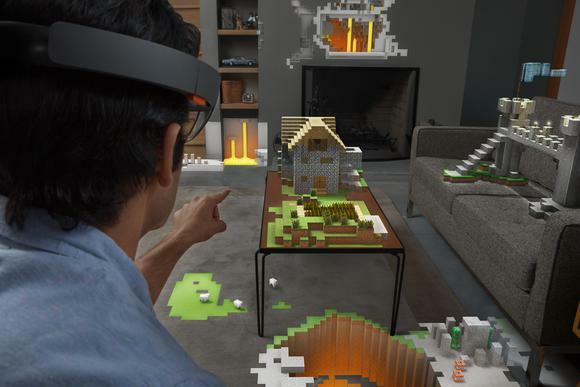 At first, Microsoft will build its own HoloLens development kit device for software developers, priced at $3000 and launching in the first quarter of 2016. The device uses advanced sensors to map holographic images on the wearer’s surroundings, from building plans to diagnostic information to a truly 3D version of Minecraft. Microsoft hasn’t said when it will launch a consumer version or how much it’ll cost. The possibility of an Asus partnership raises some new questions: Will Microsoft continue making its own hardware alongside third-party vendors, as it does with Surface devices? Will Windows Holographic hardware split into high-end and low-cost versions? And if so, what would a range of HoloLens hardware look like, and what sort of measures would Microsoft take to guarantee a certain level of quality? Why this matters: By bringing in third-party hardware makers, it seems that Microsoft is trying to establish Windows Holographic as the de facto standard for augmented reality, similar to how Windows dominated the personal computer market. Still, there are a lot of unknowns about how this plan will take shape, and plenty of competition from startups such as Magic Leap, and to some extent from virtual reality companies such as OculusVR. For now, the potential Asus partnership is just a sign that Microsoft’s augmented reality efforts are slowly making their way out of the lab.